Coffee Enema Questions and Answers: How to Start? Coffee enema - how to start when you've never done them? This questions and answers discussion with a client of mine - who is determined to overcome chronic illness - may help you begin your own protocol. Answer: Coffee enemas are great - I still do them because they make me feel fabulous! They helped get me out of trouble when I was quite sick. A good way to start is to cleanse well with warm water with maybe 1/4 teaspoon of sea salt added per quart (the sea salt keeps you from absorbing too much water - so water will tend to be expelled better (and toxins along with it). 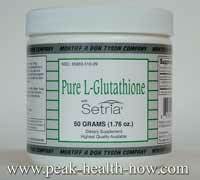 Cleanse using salt and water enema until fairly clean water comes out. Then start with small dose (1 level tablespoon of coffee) simmered 15 min in 2 - 3 cups water, and cooled down to luke warm. Lie down on old towels on left side and slowly allow coffee formula to feed into colon. Then can turn on back or right side for best results. Retain for minimum 10 minutes if you can. If not, you can make a double dose of coffee next time and reserve half of it in case not able to retain the first dose for 10 or more minutes. Gold Roast Coffee is THE best - has a wonderful effect! Get a Hair Analysis Test and follow the program consistently and persistently. Balancing your metabolism makes every other supplement you may take work better! Your body will begin to detox more on its own with more balanced metabolism and mineral ratios. Full-spectrum amino acids support tissue repair and recovery. An economical option is Montiff All-Basic powder 350 grams - 1 teaspoon per day with Tri-Phos B - 2 tablets per day. Liver/gallbladder support: In addition to coffee enema, you might want to consider Glytamins. Recovery from serious health issues takes time, knowledge and persistence. Sounds like you are listening to your body and that's great! Bag, Bucket or Syringe: Which is Best for Coffee Enema? Question: I already read some pages great information Ellen. I have had those heart palputations. And also read that eating an apple or eating greens 30 to 60 min before, helps with that or take chlorella. Good to know, recently with juicing it has helped (w/cilantro). Should I go with a syringe, bag, or bucket? Also do I do the water then the coffee enema all in the same day? Do I hold the water in, and how much and for how long? Answer: Bucket is good - you can clean it out much easier after coffee enema. Better than bag. The rubber enema bags sold at drugstores (also on enima websites) are FULL of chemicals - you can smell it - I wouldn't use regular enema bag at all for that reason. Water - just put in and eliminate - no need to hold in. Cleanse with water same day just before coffee enema. The day before your first coffee enema, you might want to do a good cleansing, then again just before first coffee enema. This provides a little more preparation for your first time treatment. Massage colon helps - put water in and massage while eliminating - do that several times until it feels lighter inside so you have room to hold coffee. It is good to walk around awhile - do things around the house or something for about 10 min before inserting coffee. 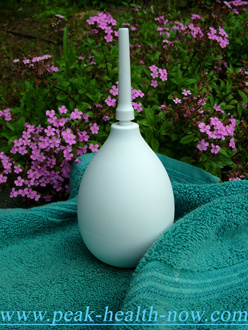 An 8 oz enema bulb works great for coffee - just 8 - 16 oz liquid (I make more of a concentrate than most coffee enema sites suggest. That way, less volume to retain - easier. Once you do this couple of times, it is really simple and you will develop your own method. Question: What do you mean by enema bulb? What Kind of Filter Do I Use for Coffee Enema? Answer: Filter coffee using a fine tea strainer, after simmering it gently for 15 - 20 minutes. That way, the polyphenols, theophylline, caffeine and theobromine will remain in the coffee to benefit you. Are Colonics a Good Idea in Addition to Coffee Enema? Sounds like you already have a colema board - go for it! Before I did coffee enemas, or even knew about them, I got into doing colemas (home colonics). Saved my life! Was doing them whenever my body asked for them - sometimes daily! Now I do them 1 or 2 x per month, sometimes less often - and they are still great for health! Did you know colonics are one of the beauty and anti-aging 'secrets' of many rich and famous? Brad Pitt, Jennifer Anniston, the late Princess Diana - did/do them regularly. And Prince Charles has infuriated the medical community by publicly stating that he sees coffee enemas as a powerful therapy. Like I say on my site, you don't have to own a yacht to be gloriously healthy! What Kind of Water is Best for Coffee Enema? Distilled water can be too acidic pH - also could absorb metal compounds from whatever container the water is cooked in for distilling. 'Spring Water' on the other hand might be good - but too many companies are a scam and just put filtered tap water in the bottles. I don't know the Mountain Valley brand - could be OK but they all say the water comes from a mountain spring or some such. The bottled water still may be a better option, depending on your water supply and the pipes it goes through. For example many people in New York City live in old buildings with old pipes, some of which have lead in them, and the water comes from a long distance through more pipes. If the plumbing in your home is fairly modern, and the water is typical but not terrible tap water, you most likely are best advised to invest in an excellent filter and make sure to maintain it and replace cartridge or whatever is needed. I've been doing some research on filters in the past - probably should try to hook up with a good supplier, as you are not the first to ask about water. The advantage of a filter, especially if it was one which filters all water coming into your home is that it would give you and your family clean water for showers, drinking etc. (we can absorb toxins easily through the skin when taking a shower). Geez, I must put this up on my site - didn't know I would write so much. Neither colonic or coffee enema is 'better' - they each serve a different purpose. If I HAD to choose one, it would be the coffee enema since in the process some nice cleansing of the colon takes place AND you get the superb liver and gallbladder cleansing action, activate the free radical fighting Glutathione s-Transferase system, absorb polyphenol antioxidant compounds from the coffee, and more. Let me know how it goes with the Coffee Enemas. Detox Combo For Bile Flow and More! 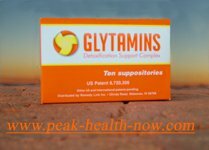 Glytamins and Xeneplex are superbly formulated, gentle yet powerful - VERY easy and convenient to use - supplements in suppository form. If you want to have a regular detoxification protocol, but just don't have the time to do the preparation, lie down for the therapy and clean up, Glytamins and Xeneplex are for you. All you do is insert a suppository just before lying down to sleep at night. It only takes a minute! You may notice that you sleep deeper and wake feeling more refreshed!